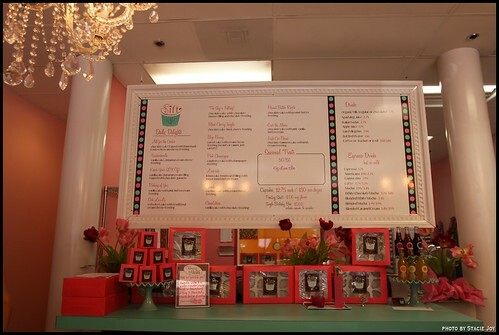 Another absolute fave of my northern California cupcaking trip would have to be Sift Cupcakery (now known as Sift: A Cupcake & Dessert Bar). 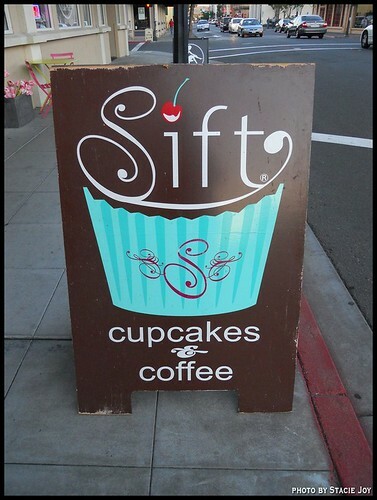 Mmm, Sift...(drool). I was lucky enough to be able to stop by two of Sift's three wine country locations. 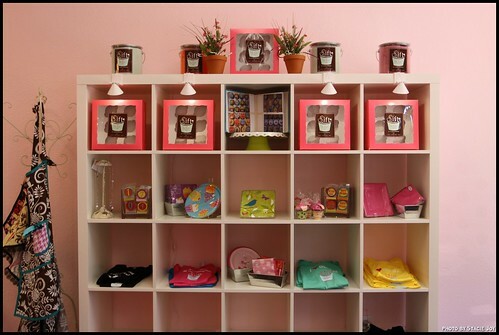 I saw the beautiful Santa Rosa store and the wee Napa shop (which shares its space with a dress shop! ), but had to skip the Cotati store. Next trip, maybe? The first thing I must mention is how wonderful all the people were at Sift. I pulled up with guest-taster Michael and I swear they treated us like visiting royalty. I'm almost embarrassed at how well they treated us, gifting us with more cupcakes that any two people could eat, and, possibly best CTTC gift ever: Replicas of our logo made into cupcakes! Another thing that made Sift so wonderful would have to be the people. 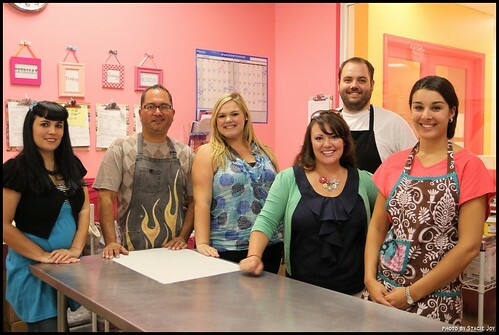 Corey Fanfa (manager), Robert Gonzalez (manager), Jordan Keith (wedding coordinator), Andrea Ballus (owner), Kevin Hammon (decorator/baker), and Christina (decorator). 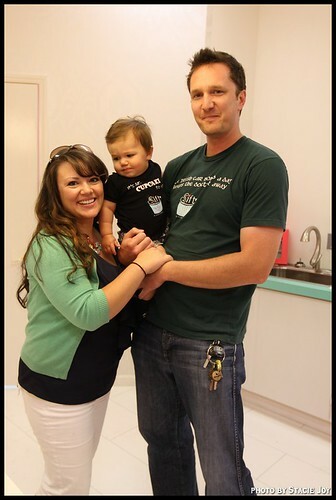 Andrea (owner), Miles (Mr. Cupcake), and Jeff (husband to Andrea and dad to Mr. Cupcake) Ballus. 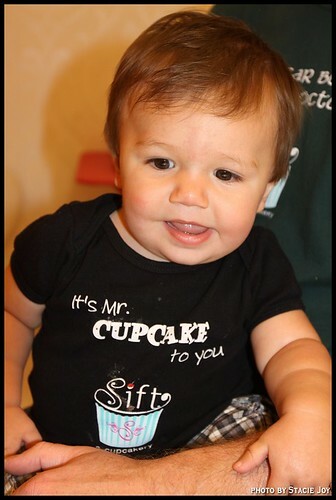 I am pretty much head over cupcake heels in love with Miles. I wanna marry him and am willing to wait until he's 18 (at a minimum). Mr. Cupcake should be the face of Sift he's such a ham. I was going to call this "the ladies of Sift" except it sounds too naughty calendar-ish, right? 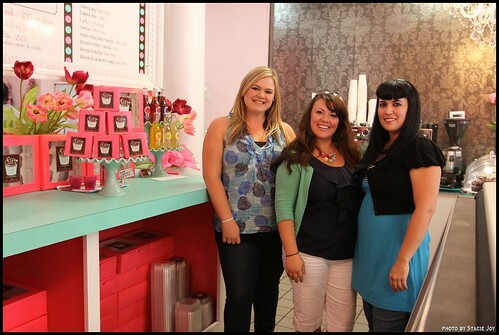 The store (I'm going to refer to the Santa Rosa store for the rest of the review) is beautiful. Lush and pink and sparkly and very well-appointed. Whoever designed the space did an amazing job. Modern-retro, if that is such a thing. If not, I am making it up now. Michael said he thought it looked like an old timey ice cream shop, with modern colors, and we both noticed it was so squeaky-clean! 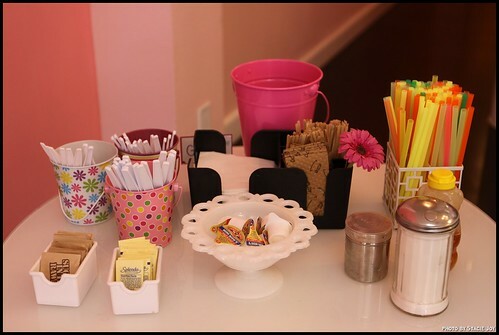 Even the coffee station was spotless! But as I always say, all the other stuff is great but what about the cupcakes? 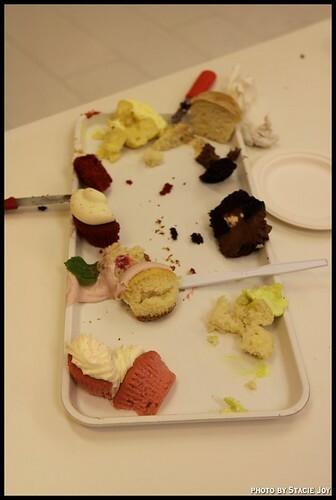 It's really all about the cupcakes...so how did they taste? Lucky for me, they tasted terrific! 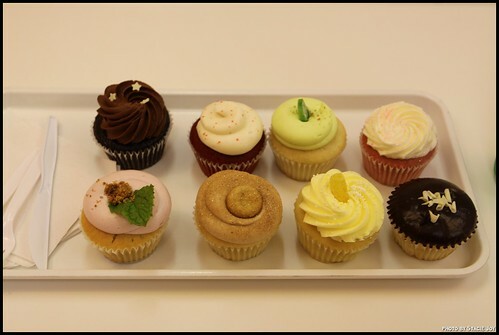 Left to right, back row: The Sky Is Falling, Ooh La La, Key Lime Bliss, Pink Champagne. Front row: Not So Humble Pie, Snickerdoodle, Limonata, Knock Your Sox Off. My favorite would have been the Knock Your Sox Off (Boston cream). So delicious! 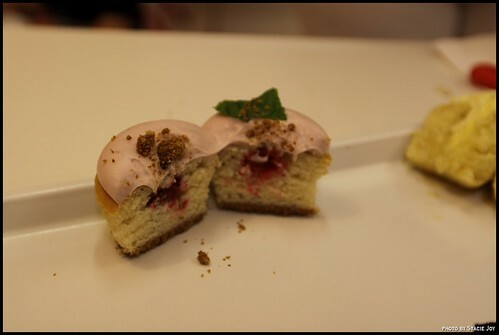 The pastry cream filling was spectacular and the cupcake was moist without being too moist. The chocolate ganache was nice and dark and not overly sweet, which is my preference. So simple and yet complex tasting. I thought it was a definite winner. Worth the drive, that's for sure! 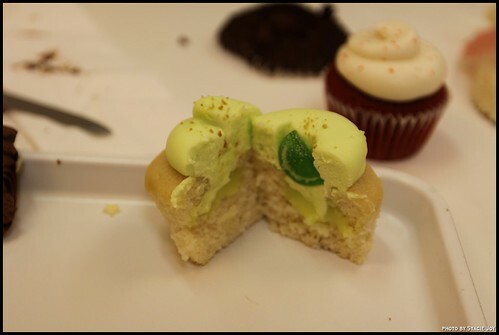 Both Michael and I loved the Limonata (lemon cake) and Key Lime Bliss (vanilla with key lime filling). Both were light and refreshing, and since it was almost 90 degrees that day, that was much appreciated. The Key Lime Bliss had a key lime mousse frosting and the Limonata had a housemade vegan lemon curd inside. Yum! It's calling to you too, right? 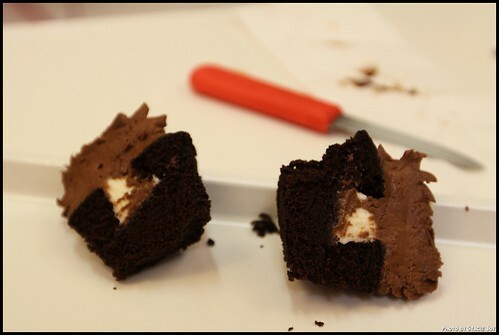 The Sky Is Falling is a chocolate cake with a white chocolate mousse filling and a darker chocolate frosting. A triple-hazard. So damn good. I can easily believe that people drive for 2 hours just to eat this. (No joke, people consider Sift a destination restaurant.) 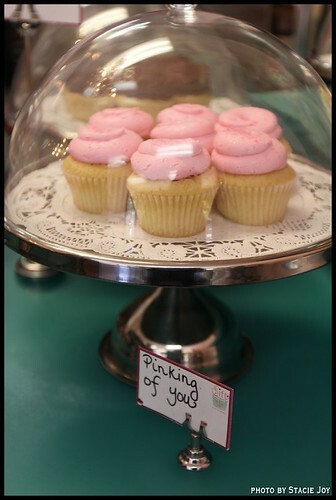 I would have loved a big ol' glass of ice-cold milk with this cupcake. 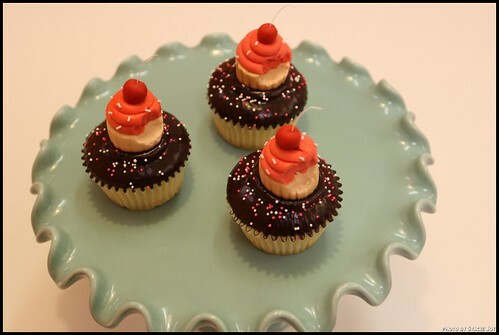 If you are trying several cupcakes, make this the last one you try. It's very rich and potent. 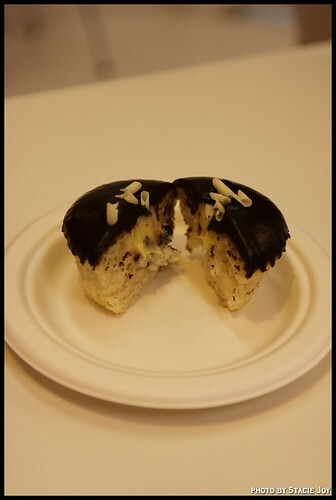 I was told that the bakery held a contest to name the Boston cream cupcake, and the winner (and crowd favorite) was: Knock Your Sox Off! Hee! Get it? Boston? A runner-up "More Than a Feeling" from the band Boston. Knock Your Sox Off (which I loved, even though I am a Yankees fan). Oh we were so stuffed! Michael almost had to roll me out of there. Worth every calorie and then some. 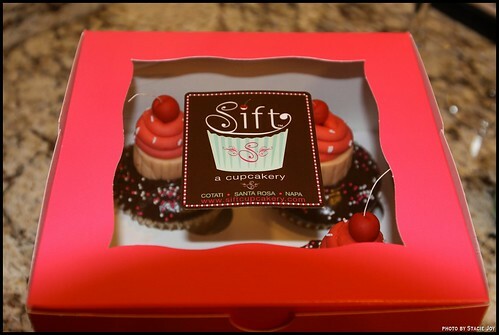 Thank you Sift people for your hospitality and warm welcome and best of all, cupcakes. And Miles. 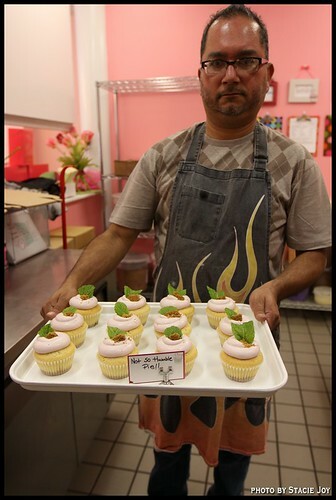 Mr. Cupcake indeed. All pictures by Stacie Joy for CTTC, see entire Sift set here. How fun!! 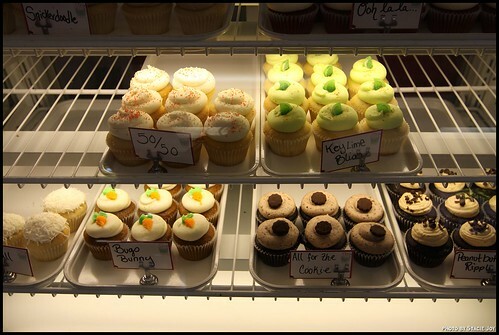 I adore Sift cupcakes but have never been to one of their shops. I am moving to Santa Rosa and can't wait to visit! These look amazing! And omg, that adorable baby looks exactly like his daddy! (or at least, I think it's his dad). 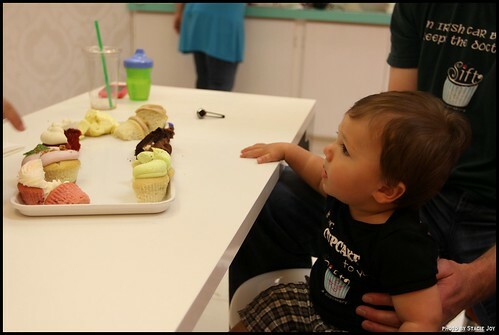 I critique and review desserts at www.DessertDarling.com, but I'm pretty limited to the Los Angeles area. 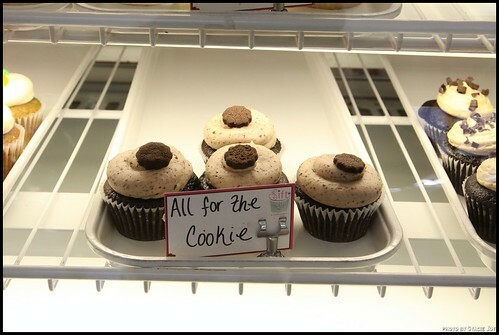 I'm getting married in Santa Rosa.. was going to go with Susie Cakes, but now I must try these!